Hair Stylist. Extension Artist. Educator. Michelle began her career in the beauty industry as a manicurist. She quickly fell in love with doing hair, but came across one big problem - she could cut it, color it, and even make it curly or straight, but she wanted more...SHE WANTED TO ADD IT! In 2001 Michelle discovered extensions and the rest is history, or should we say HERstory! Michelle has a long list of celebrities she has had the privilege of working on. She has styled singer/actress Christina Milian's hair for VivaDivaWines.com and illuminationpr.com press events. She's worked on Mobwives, Housewives, Radio DJ's, Television hosts and more. Her work has been featured on TLC's "Homemade Millionaire" and Style Network's "Glam Fairy" just to name a few. Her work has also awarded her the privilege to work on editorial shoots and production sets and occasionally travel to private locations when needed. 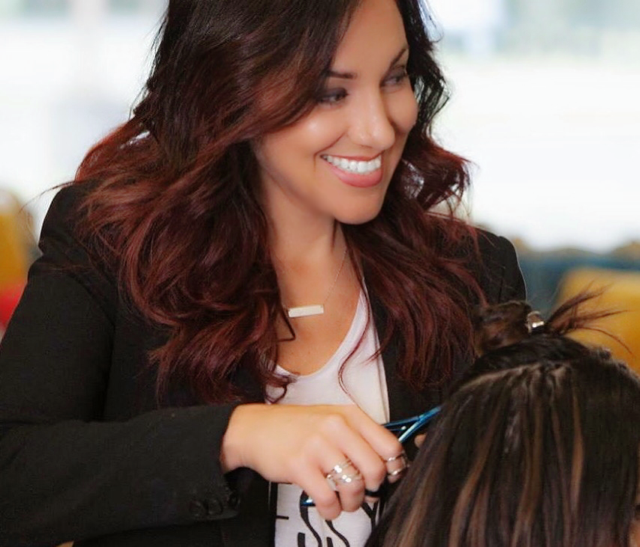 Michelle has studied and trained in the art of advanced cut and color in such cities as London, Miami, and New York and has multi-certifications with advanced academies such as Vidal Sassoon, Toni & Guy and Wella. If you are lucky enough to sit in Michelle's chair it's VIP treatment all the way! Whether your working in front of the camera or you are a stay at home mom, every one of her clients is treated like a celebrity!!! Tracy has been working her magic on the tresses of Ocean County for more than almost 20 years. Early in her career, she had the unique opportunity to work alongside a Barber. This incredible experience honed Tracy’s stylistic skills, especially with Men's haircuts. In addition to the talent and expertise that makes her stand out among her peers, she has added the following to her resume: she has studied abroad at the Tony & Guy Academy in London, in addition to earning multi certifications in color, cut and style from both Wella and Sebastian in NYC. Her keen eye and diversified techniques of formal styling can be seen everywhere from bridal parties to her editorial work on health and fitness models throughout the state. Her passion to create something that is both stylish and maintainable makes her the stylist of choice by many men and women. Tracy draws inspiration from her clients, coworkers and mentors. She is incredibly grateful for the experiences that have challenged her and helped her grow both as a person and a leader in the hair industry. Amanda is the definition of HUSTLE! Transitioning from an assistant to full time stylist Amanda works just about every area in the salon, but don't let her age full you: she is extremely talented, creative and eager to expand her education within the industry. Jamie realized early that constantly educating herself was the only way to stay fresh, and on top of the game, in this business. While working simultaneously in her salon, she ventured out and started to work with many of the top companies in the industry. These companies included, but were not limited to- Matrix, Macadamia Professional, L'Anza, and F18. Her experience with these companies allowed Jamie to share her passion for color, cutting, and styling techniques to a global demographic. It also allowed her to work with top models and celebrities, for photoshoots, hair shows, and concert venues. One of her favorite highlights was working closely backstage with Jennifer Lopez and her dancers. Jamie's latest certification is for the Calligraphy Cutting Method. This has placed her into an idolized group of only 480 stylists in the U.S. that are certified to use this unique method of cutting hair. The journey continues; Jamie, along side her Hair Addict Team, can continue to practice what she loves doing best- Making her guests look and feel their very best!